If you grow up near the water your desire is always close by to the water or bring some water breeze to your house. If you have a bond to the water,your kid will follow your footprints. This bond passes from one generation to another. In this article, you will find out some good pictures about Nautical Boy Bedroom Ideas with some explanations. Usually the stripe fabrics are used to decorate the nautical boy bedroom. The main nautical colors are, white, red, navy blue and blue. To remind the nautical term, some hanging signal flags or flags on bedding. You cannot think a Nautical Boy Bedroom Idea without sailing boat. I think the cabin style windows, cabin, compass, navigation map, lighthouse, steering wheel, captain’s bridge ,buoy and rakes can take place in the theme. The good things on the theme are using any elements you long for it. Hopefully the pictures will find you well by having some Nautical Boy Bedroom Ideas. Picture Credit: Studio M Interior Design. The white panel bed , blue nightstand and white bookshelf is such a good selection for this room. Striped quilt cover and plain and small printed pillows are used for cute bedding . Buoy, accent pillow and sign flags are very neat. But the naming letters over the book shelf is the cutest. Very admired design. Picture Credit: Ourtownplans. I really like the idea of the sliding bedroom door. It saves to much space. Two Captains Bed in a row is an excellent design. Light blue and white striped area rug, buoy and rake wall decorations, monogrammed pillows, red and white bedding bring me the ocean scent. Adorable. Picture Credit: Gloss NY. Off white boy bedroom furniture, contemporary style matches perfectly with sign flags theme area rug and bedding and nightstand lamp. The wall paper amazingly shows the navigation map and red toy shelf is a plus. 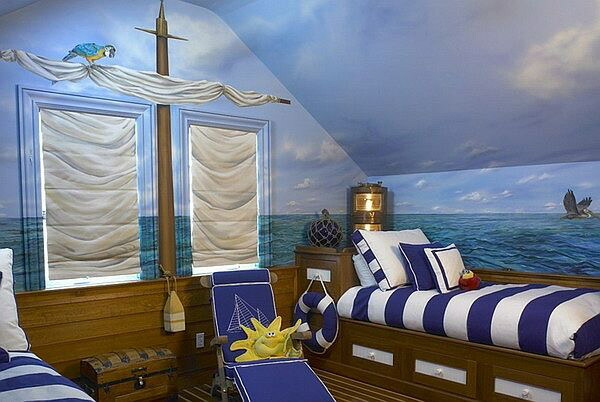 Hats off design for Nautical Boy Bedroom Ideas. Picture Credit: Mary Cook. Full size bunk bed with nautical theme. My first priority in this room is the rake rack ,ottoman,striped wall borders and curtains . Nautical bedding is very unique, The Headboard is catchy. Picture Credit: The Baby Cot Shop. Such a cute loft bed for a little sailor! Sleep in the top, play in the bottom of the sailing boat. Striped wall colors with striped port hole curtains and striped loft bed cabin curtains , steering wheel and captains bridge this design takes its place in my heart . I like the blue furniture color. Stay tuned; my next article is Pirate Boy Bedroom Design. Please drop your comments and please take look for the coming idea.